Peechinga Thoran is highly nutritious and power packed with all vitamins, fiber and minerals. Ridge gourd or Dodka / Luffa is known as Peechinga in Malayalam, Peerkangai in Tamil and Turai in Hindi. The deep green Peechinga helps to purify the blood and helps to regulate blood sugar levels. Most people are unaware of the benefits of Peechinga and tend to avoid this wonder vegetable. 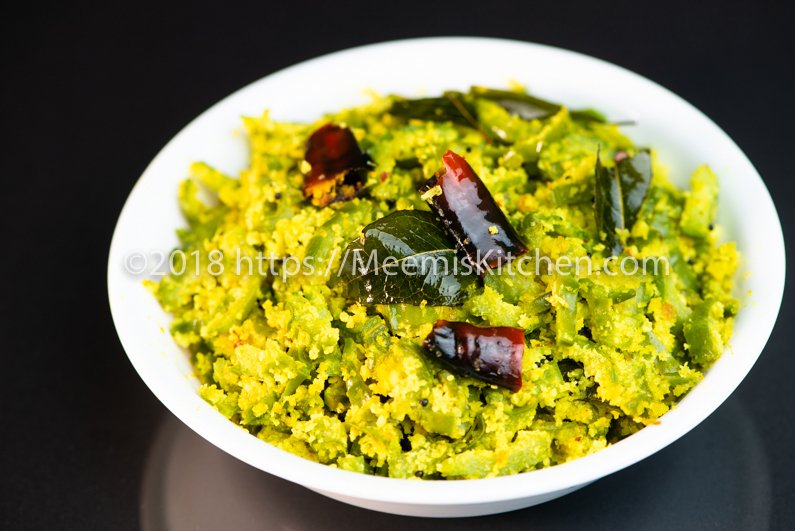 This Peechinga thoran is a great side dish for rice and you will definitely love the distinct taste.Serve Peechinga thoran, Tomato Rasam, Kovakka fry, mezhukkupuratti with rice for a comforting Kerala lunch. In Kerala, Peechinga thoran is prepared in many ways. My mom loves preparing all the gourds like Pavakka (Bittergourd), Kovakka (Ivy Gourd), Padavalanga (Snake Gourd), Churakka (Bottle gourd) etc. She loves preparing variety vegetable dishes and mix and match veggies to make it more appealing. However, Peechinga is not mixed with any other vegetable, as it would then spoil the distinct taste of Peechinga thoran. For lunch, most of the Keralites need Thoran as side dish for rice and the variety thorans are exemplary. Peechinga Thoran is quite simple to prepare and has very few ingredients. It is essential to choose tender Ridge gourd for Peechinga Thoran; soft but firm, dark green in color and without blemishes. Make sure you get fresh ones as some might taste bitter if kept for long. Some people take out the whole skin, which is rich in fiber, so I advise not to do that but to follow the instructions below to get the best of it. Please check all my variety Kerala Thoran dishes like Vazhakka Cherupayar thoran, Padavalanga Carrot Thoran, Kovakka Thoran, Churakka Erissery, Pappaya Thoran, Cabbage Cherupayar thoran, Vazhakoombu thoran, Moong sprouts thoran, Mushroom thoran, Green Beans thoran, Kaya Thoran, Cheera parippu Thoran, Beans carrot thoran etc. It is great to have colorful mix veg. thorans that blend well to create appealing tasty dishes. Hope you will try this healthy, Kerala style Peechinga Thoran. Enjoy!! Peechinga (Ridge gourd) : 2 nos. Green chilly : 2 nos. Wash and clean Peechinga (Ridge gourd) thoroughly. I use a tooth brush to clean the outer parts of Bitter gourd and ridge gourd under running water, for thorough cleaning. Remove and discard the outer hard ridges but do not take out the whole skin. 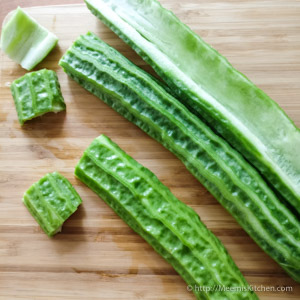 Cut through middle, lengthwise and discard the soft insides and seeds. Again, cut into 1-inch length pieces. Now, cut into thin strips lengthwise – this helps to control the release of water while cooking and keeps the fiber intact. Grind coarsely the coconut, onion, Green chili and turmeric powder with few curry leaves. Heat a pan and add 1 tsp. of coconut oil. Add mustards and when it crackles add red chilli and curry leaves. Next, add the diced Peechinga and salt. Sauté for a minute or two on medium flame. Mix in the coarsely ground coconut mix and cover and cook for a minute on low flame, stir and combine well, adjust salt and cover and cook for another minute. Peechinga requires very less time to cook. Have a great Kerala lunch with Peechinga Thoran, Fish curry and rice. Yum! Always buy fresh and tender ridge gourds, soft but firm which is dark green and without any blemishes. Do not take out the whole skin of Ridge Gourd. Only the hard- outer ridges need to be removed. Cutting it lengthwise helps to control excess water release and keeps the fiber intact. 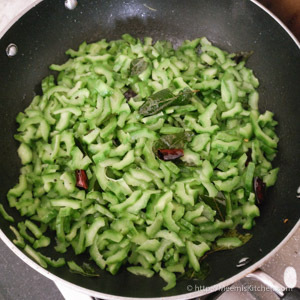 Ridge gourd requires very less cooking time. Over-cooking will make it mushy and colorless. You may add Jeerah / Cumin to the coconut, if you like. I prefer without jeerah, so as not to overpower the taste of Peechinga. Ridge gourd is nutrient rich and high in fiber and vitamin C.
It is low in calories and high in water content and aids in weight loss as it has good dietary fiber. Rich in anti-oxidants, it controls and reduce skin infections and acne, and helps to purify and detox the blood. Turai/ Peechinga contains insulin like peptides which helps to maintain blood sugar levels. Also, Ridge gourd is a good anti-inflammatory agent and has anti – cancer, anti-aging properties as well. Include this nutrient rich Peechinga thoran in your weekly lunch menu for a healthy diet. God Bless! !